Ra Paulette is quite a solitary person. He has spent most of the last quarter-century alone in the New Mexico wilderness, save for his dog, digging caves in the Ojo Caliente sandstone near Embudo. Describing his work as “caves” does them no justice. 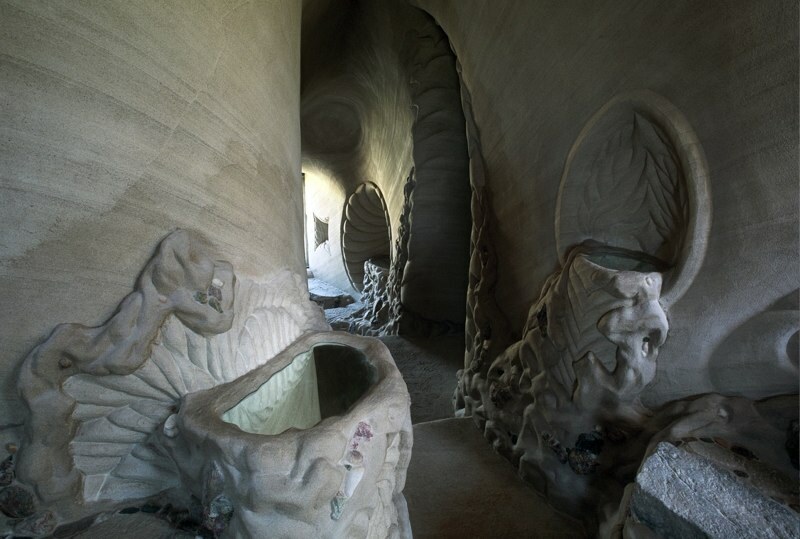 Instead, what he creates are magical subterranean rooms and shrines with smooth walls accented by swirling carvings, Gaudi-esque curves, and molded pods and ledges. His intention is to create transformative spaces. 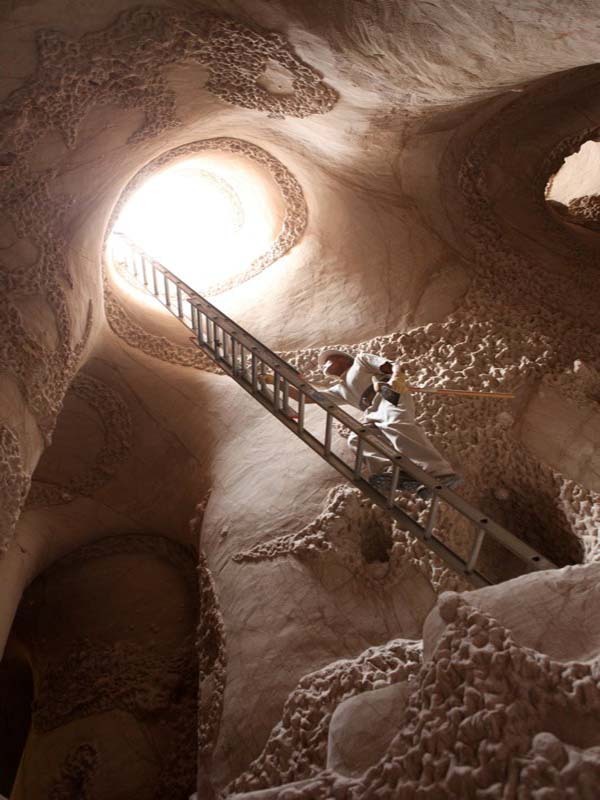 In the 2013 film Cavedigger, created by Jeffrey Karroff, Ra says: “The fact that the cave is underground, and you feel the Earth around you, yet the sun is pouring in. Those are the juxtapositions of the two metaphors of our life. The within and the without. 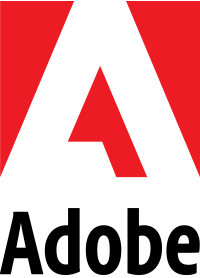 It’s a perceptual trick that brings out deep, expansive emotionality.” The film was nominated for an Oscar for Best Documentary Short earlier this year, as well as winning awards at multiple film festivals. 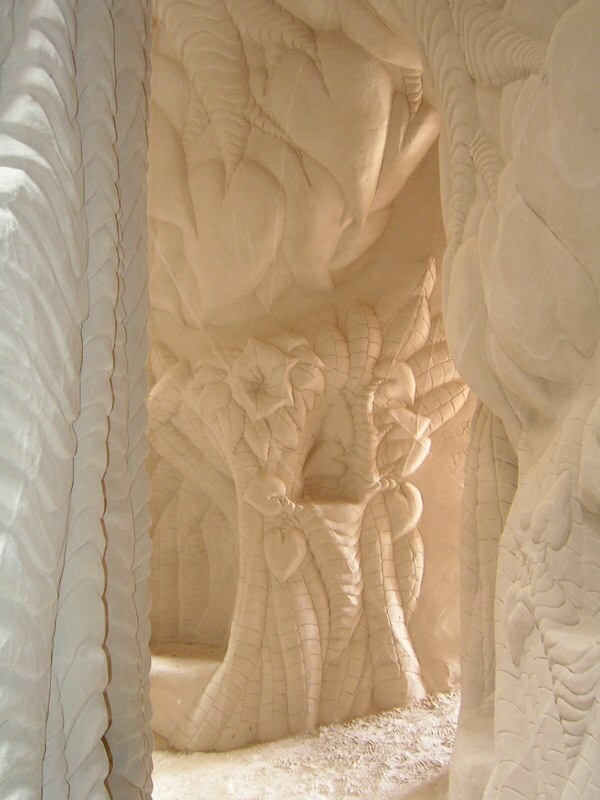 In addition to their breathtaking beauty, and what one can only imagine would be a visceral experience to actually enter one of the 14 caves he has created since 1986, what is most astounding is that he creates these sculptural masterpieces using only hand tools. No dynamite, no tractors, no pneumatic drills. Instead, he uses a pickax, shovels, handheld scrapers and a wheelbarrow to dig, excavate and carve entirely by hand. He also doesn’t work with drawings. Calling himself an intuitive engineer, he says he can feel where the space should be, the walls and the floor. He digs in 15 to 20 feet, and then breaches upward to bring in sunlight and ventilation. The soft nature of the sandstone allows him to create effects that would takes years if he was working with harder materials. Yet with all of his excavating and carving, he’s conservative with the structural elements of the caves, as he has great concern for the safety of anyone who should visit. Over the years, he has also tried his hand at a number of commissioned pieces. His intuitive way of working didn’t always sit well with his patrons, and he certainly blew timelines out of the water (although he claims that, contrary to popular belief, he knows when a project is finished). Out of his commissioned pieces, the only one that was ever finished completely was created for his former girlfriend Liz Riedel and her partner Shel Neymark. While his first cave – called the Heart Chamber – became so well-visited that he eventually had to fill it in for safety concerns (not to mention that it was built on public land without permission), his other 13 caves are not so easy to find or get access to. 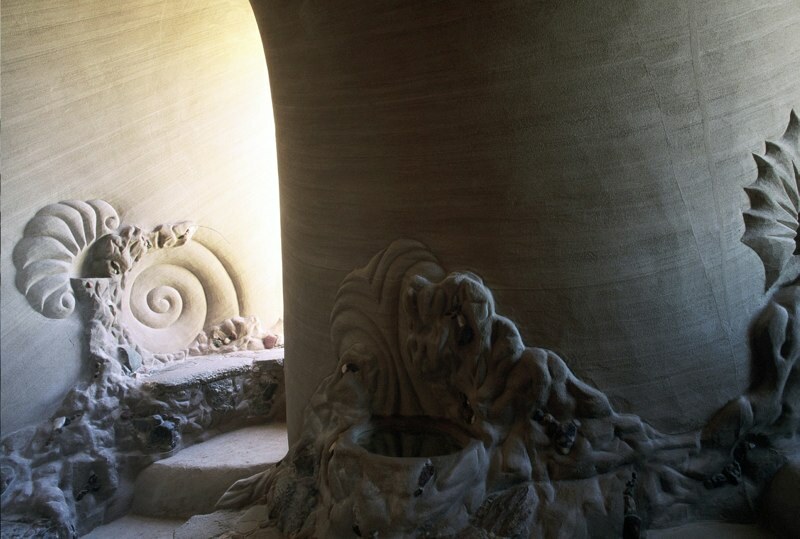 His Windows in the Earth sandstone shrine, commissioned by David Heath, used to be accessible by asking for a key and paying a small fee at the Rancho de San Juan resort (or free to guests), however the resort has since closed. Ra says even this cave was only ever about 85% complete. In the film, he tells the story that despite the owner feeling that his addition of mirrors to the space would cheapen the effect of the shrine and take away from its naturalness, Ra went out and bought the mirrors, brought them up to the cave and installed them anyway. The effect is amazing, making them look like pools of water that reflect the sunlight. They remain in place. One cave, named the Tree of Human Kindness, sits on a 208-acre plot of land between Santa Fe and Taos that is currently for sale. The other caves tend to be on private land, sometimes with very private and well-armed neighbors. It seems that anyone curious enough to go out and find these masterpieces would do well to ask around with the locals rather than trying to find them on their own, or perhaps try reaching out to Ra himself.